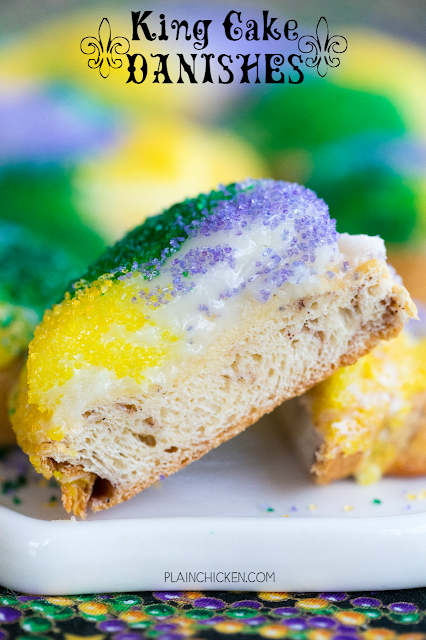 King Cake Danishes - only 5 ingredients! These things are SOOOO good!!! Perfect for Mardi Gras! Crescent rolls, cinnamon, cream cheese, powdered sugar and milk. Can make ahead of time and reheat for Fat Tuesday breakfast! 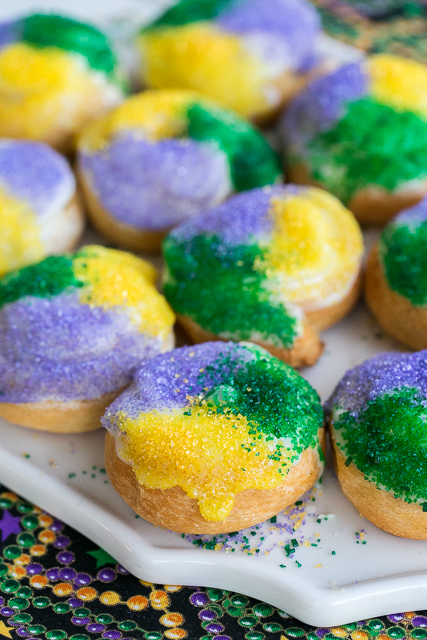 King Cake is my favorite Mardi Gras food! I love making twists on the famous Mardi Gras treat. This year I am all about these easy King Cake Danishes. O-M-G! SO delicious!!!! They are also SO easy to make! The base of the danishes are made with refrigerated crescent roll dough. It works great in this recipe. I sprinkled the dough with cinnamon and then rolled it up and into a coil. I topped the dough with a sweetened cream cheese mixture and baked them. Once the danishes were slightly cooled, I dipped them in some icing and sprinkled them with colored sugars. We could NOT stop eating these King Cake Danishes! They were crazy good. This recipe makes 16 small danishes. The danishes taste good reheated. We ate several and saved some for the next morning. They are perfect reheated for a few seconds in the microwave. Perfect treat for Fat Tuesday! Separate crescent dough into eight rectangles and seal perforations. Sprinkle rectangles with cinnamon. Cut each rectangle lengthwise into to two long rectangles. Roll up from long side; pinch edges to seal. Holding one end, loosely coil each dough log. Press down in the center of each coil and make an indention to hold the filling. Mix together cream cheese and 1/2 cup powdered sugar. Top each coil with cream cheese filling. Place on baking sheet. While the danishes cool, prepare glaze. Combine 1 cup powdered sugar and milk. Spoon glaze over cooled danishes and sprinkle with colored sugar. These are just so easy and cute. Will make for Fat Tuesday.